For the past few days, we’ve had a slow start and we’ve left the house relatively late. That trend bucked this morning. Surprisingly, nobody was in a bad mood (it’s all relative in the mornings). We had planned on stopping at a Walmart for something or other this morning, so we made our way to the one on 192 not far from I-4. When we got there, the car park was full of people standing at their cars. Initially, I thought everyone was waiting for the store to open, but it was already past 9am. I parked, and Sandy got out to see what the story was. It seemed that there had been a bomb scare or something of that nature. This triggered the temporary closure of the store, sending everyone back out into the street. We told the kids it was probably an electrical fault that resulted in the registers no longer working. It didn’t seem like a wise thing to do to tell them anything else. After a short wait, we decided to cut our losses and drove away. On the road, we saw numerous police and other emergency vehicles heading in various directions. Then the penny dropped. Today is 9/11. That tends to generate a huge number of false bomb threats and other non-existent emergencies here. Rather than take the risk of being kicked out of Walmart for another bomb threat, we decided to cut our losses and went for breakfast instead – not much chance of a bomb threat to a Waffle House. It just so happened we were in the vicinity of one of our favourite Waffle House restaurants, so we drove on over and had a nice big meal. With breakfast done and dusted, we set off towards Universal, where we anticipated a near full day of theme parking. At the car park entrance, we were relieved of our $22 for the privilege of using the parking facilities. Sandy spoke to the lady at the booth about us having an autistic child and we were duly issued with special permission (via a slip of coloured paper under the windscreen wiper) to park by the elevator at the end of the row, so we could make a quick exit if need be. 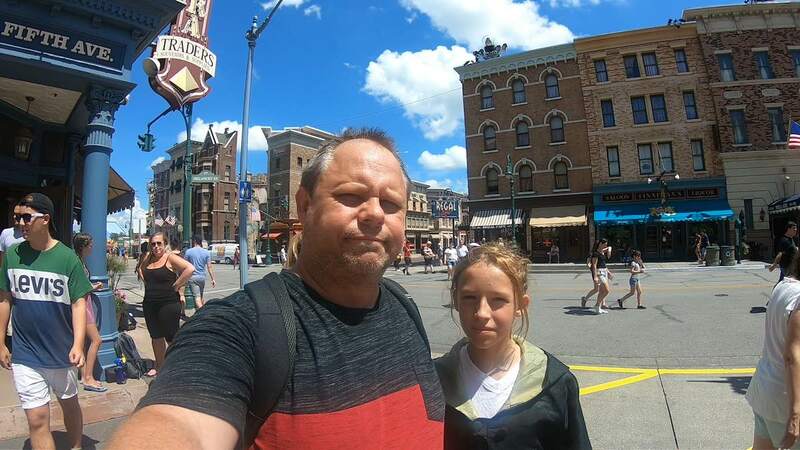 After some discussion in the car on the way over, we decided we’d hit the Universal Studios park first today. When we left the park yesterday, we noticed there were a couple of attractions we felt would be good options for the kids near the park entrance. The first of these was the Shrek 4D ride, so we rocked up to the express pass entrance. This was one of those rides that takes people in large batches, so there really wasn’t much benefit to using the express lane. The weather was particularly blistering today at well over 30 degrees Celsius. Joey was immediately finding it difficult. Both Sandy and I read the signs and felt we needed to get him inside or give up on the attraction. I went and spoke to the attendant and explained the situation. He was very good. He understood the problem straight away. We were immediately extracted from the queue and taken via a side door inside to where it was nice and cool. As it happened, they called everyone else inside right at that point as well, but we still benefitted from not having to shuffle along with the rest of the sheeple. We were placed into a special section inside that was separated slightly from the rest of the two hundred or so other ride participants. We were now in the pre-show hall, where we were entertained ahead of going into the theatre to take our seats. Like many of the attractions, this was a 3D ride that involved special 3D goggles, a large theatre screen and rows of chairs that moved in unison with the action on the screen – all themed beautifully to the Shrek character and movie. Between the moving chairs, the movie on the screen and the sprinkles of water that hits you every now and then, it was a really good experience that everyone enjoyed. Just a cross the street from Shrek 4D is a very similar 3D ride themed around Despicable Me. The only real difference was the theming and the configuration of the seating. Whereas Shrek 4D was in what looked like a regular movie auditorium, the Despicable Me ride had several rows of special four-person chairs (rollercoaster cars) with a lap-bar. Otherwise, the effect generated by the movie watched through the 3D goggles and the motion of the seating was exactly the same. We enjoyed the Despicable Me ride perhaps a bit more but only because it was slightly funnier. Both attractions were very good. We decided at this point we would split up into pairs. Sandy would take Joey over to the Fieval’s playground area while Jennifer and I would make our way towards the Harry Potter section of the park. We agreed we’d meet up at around 2:30pm, which was about an hour and a quarter hence. To be honest, not a lot of thought went into this. None of us really had much of an idea about how much time we would burn going off doing what we planned on doing. In retrospect, this was the making of a disaster of timing that would come back to bite us (or me)…which it did. Visible from most of the park is a red rollercoaster that looks especially awesome. We saw it in action yesterday. Jennifer and I have both been drooling over the prospect of experiencing it since. As it was pretty much right next door to the Despicable Me building, that’s where Jennifer and I went to straight away. 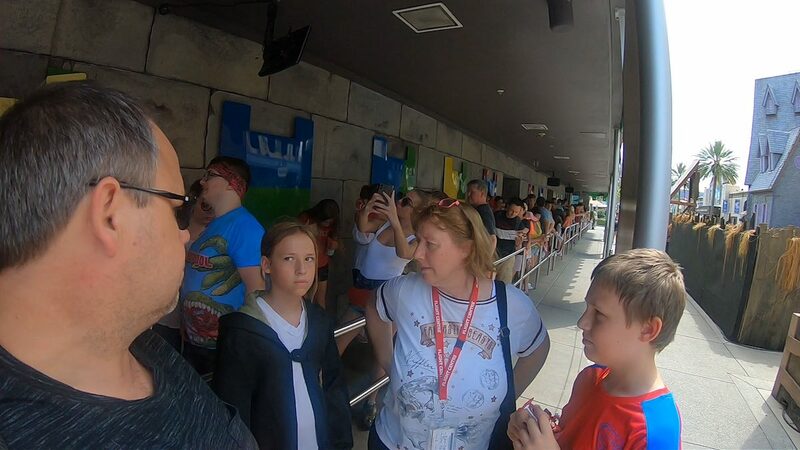 As was the case with the Hulk rollercoaster yesterday, we weren’t allowed to take the GoPro or anything else with us. They are quite strict about this here. They even have multiple check-points and even a metal detector with staff manning metal detecting hand wands (not the Harry Potter type). We put all our things into the free lockers. It’s great they are free but the way they have designed the lockers area forces a lot of people into a relatively small space, so it’s always quite cramped when depositing or collecting your locker contents. Nevertheless, we managed it and made our way onto the ride. They did have to re-position us into a different row as I wasn’t able to get the restraint lowered and locked without it preventing me from breathing comfortably…or at all. During the rollercoaster, you get to listen to one of a number of tracks that you choose from a panel in the rollercoaster chair itself. I chose ‘I will Survive’ by Gloria Gaynor. Not sure why they had that particular track available but there you go. The ride begins with a sheer 90 degrees climb, then a near sheer drop on the other side. It’s a conventional rollercoaster from that point on, albeit a really very good one. Next up for Jennifer and me was the Mummy ride. This one was quite similar to Space Mountain over at the Magic Kingdom in that it’s a rollercoaster but in the dark and with no inverted loops or anything like that. A bit of a twist with this one is that it goes both forwards and backwards. 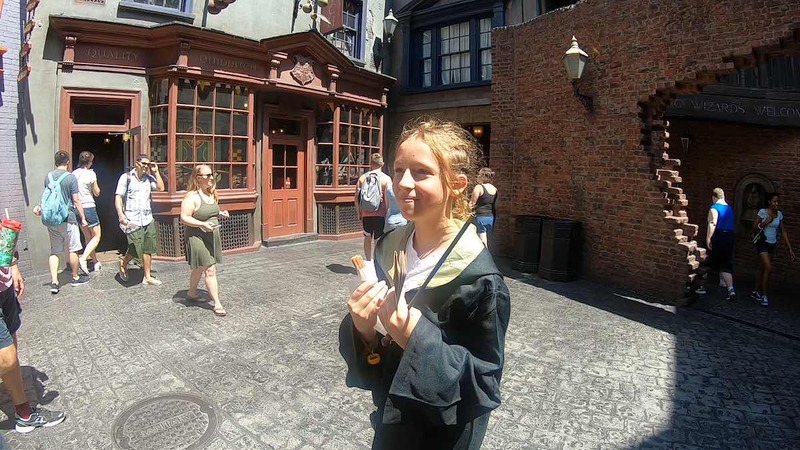 Jennifer initially didn’t want to bother with it – she was fixated on getting to Diagon Alley – but she really liked it in the end and was glad we did it. Adjacent to the Mummy ride is, of course, Diagon Alley. This is really the whole reason we’re here. Jennifer was already prepared for this, wearing her Harry Potter cloak and toting her brand-new wand we purchased yesterday for the occasion. Neither of the kids were content yesterday with the fact they already had a wand each back at home. Worse still, neither of them was content with a ‘normal’ wand. Oh no! They had to choose one of the new ‘interactive’ wands. A steal at only $53…each, right?! And the best part? They only work in the Harry Potter sections of the theme parks. Outside, they are just ordinary wands, or as I used to call them when I was growing up…sticks. Funny enough, I never used to spend any money on ‘sticks’ when I was a kid. I could readily find them on the ground, in parks or in shrubs and bushes. Oh, how the modern world has progressed, but I digress. 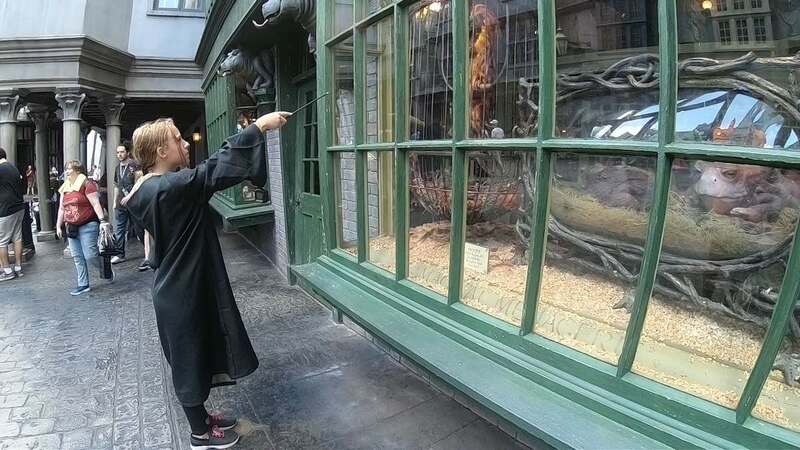 Jennifer was keen to test out her interactive wand in Diagon Alley. The wand came with a map that depicts all the places around this section of the park where you can wave your wand in a certain way so as to cause ‘things to happen’ magically. 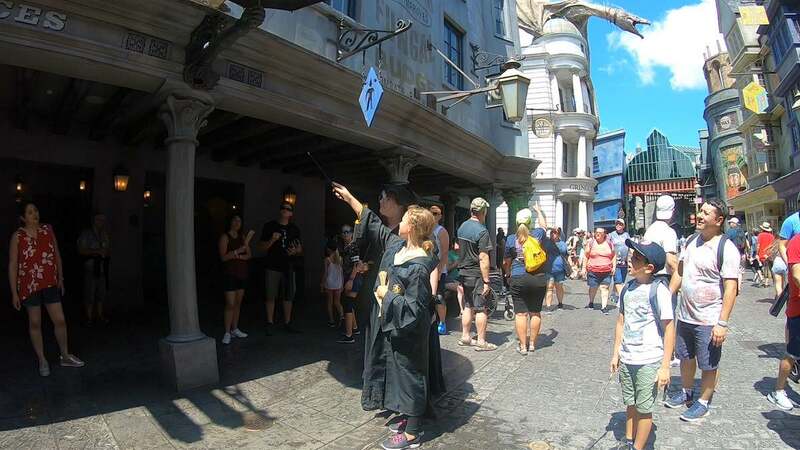 Each of the twenty or so locations are marked with a gold plaque on the ground onto which the particular ‘spell’ (which way you swish your wand) is imprinted. Aim your wand in the right direction and ‘cast’ the right spell and something magical happens. It could be anything from turning on some lights, making an umbrella spout water and so on. To be fair, it is a lot of fun. That said, Jennifer’s wand just wasn’t doing it. Eventually, a witch (yes, complete with robe and all) approached Jennifer to help her but even a seasoned witch wasn’t able to cast the right spell. 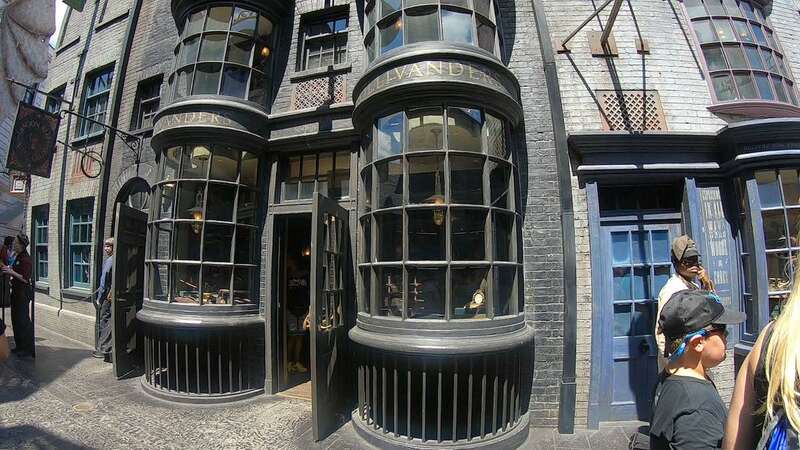 It seemed that Jennifer’s wand needed a wand repair and we were directed to Olivander’s to have the wand inspected. This we did, and Jennifer’s wand was taken behind the scenes in Olivander’s to be repaired. It reappeared moments later and was handed back to her. This time, when she went to cast various spells, the wand did in fact work well. Jennifer had lots of fun experimenting with her newly repaired magic wand. 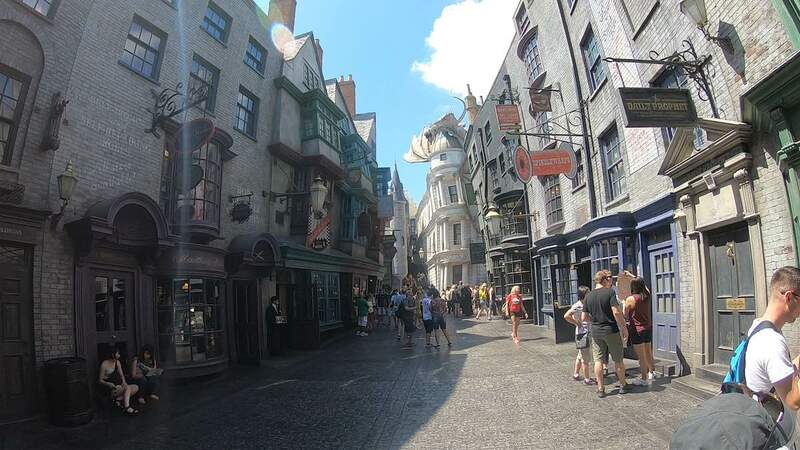 You can only have so much fun with a magic wand, however, and the Escape from Gringotts ride – the main attraction in Diagon Alley, other than the actual street itself – beckoned. Jennifer and I stowed our possessions in the free lockers and entered the express lane. It has to be said that even the regular standby lane was empty each time we went into this ride. Although there are plenty of people about, it’s still a very slow time of the year for the parks. The ride was a real thrill once again (Jennifer and I did it last night). By the time we were kicked back out into the street, I felt it was high time we re-joined Sandy and Joey. Indeed, Sandy felt the same, as it was a full three quarters of an hour past the previously agreed time to meet up. Sandy was not pleased. I knew this just as soon as I retrieved my phone from the lockers. There were several messages from Sandy, each of which slightly irater than the previous. I remember thinking to myself just how nice a pool bar would be in the kennel. Sandy’s disposition wasn’t being helped by the hot and humid weather. We did eventually all meet up at Fievel’s Playground over at the other side of the park. Just getting there meant I was also now quite hot and bothered myself. I took it upon myself to make an executive decision to go and find somewhere inside where we could have a bite to eat. With a bit of assistance from one of the snack booth attendants, we were directed to the restaurant in the Simpsons area, adjacent to where we were. It was at this point that our day took a rather interesting turn. When you go into a theme park restaurant, you sort of expect to be fleeced to within an inch of your life. Nobody likes it, but I think everyone expects it all the same. The food is going to be extortionately overpriced. Ok, so I’m conditioned to ‘tolerate’ this, albeit I don’t like it. What else do I want from a counter service restaurant? I just want to know what I’m getting and how much it’s going to cost. I also want to get in, get my food, eat it and get out again. Know what I’m getting and get it quickly. Is that really too much to ask? I mean, seriously. How hard can it be? In the Disney theme park counter service restaurants, you order and pay and then you collect your food from the counter. There are clearly marked prices and TV screens overhead that prepare you for what you’re going to order and how much it’s going to cost. The whole thing works well enough if the staff behind the counter are organised and the food is being dispensed fast enough. In this particular counter service restaurant, everything was about face. Firstly, there were multiple lines depending on which food counter you wanted to order from. You could order from the fish counter, the pizza counter or the burger counter. If you wanted pizza and a burger or hotdog, that meant having to queue up twice. Worse still, you might not realise you have been queuing in the wrong place until you get to the front of the line and then realise you have to queue up in a different line all over again. Already the system is flawed from the get-go but OK. Sandy was in the queue to get something for her and the kids while I was in one of the other queues to get something for me. The problem was that the TV screen above my food counter was off. 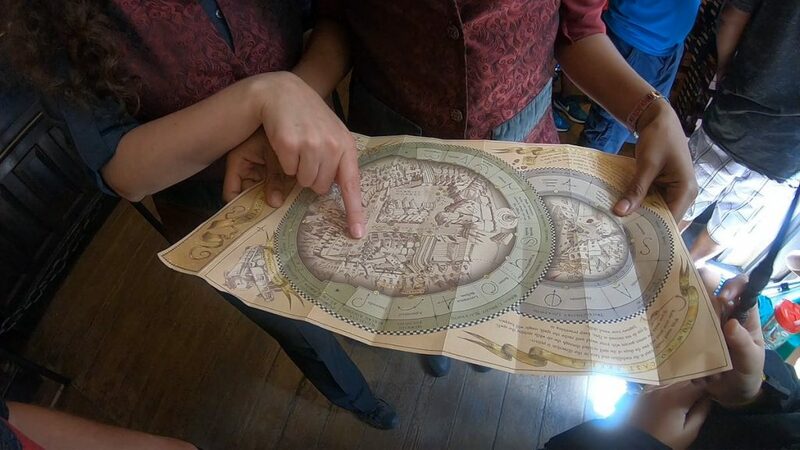 They did have A4-sized cardboard menus that showed what food was on offer but there was no pricing information printed on them. Worse still, the glass counters in front of where the food was kept hot in the bay marines was covered with decorated vinyl, which meant you couldn’t see the food. It was really hard to know what I was getting or how much it was. This frustrated the hell out of me. Was this a deliberate ploy to obscure the price so as to confound you into spending more than you realised? I politely asked the attendant that was making sure people were being directed into the right queues if she knew what the prices were. She said I could just ask the staff behind the counter. The problem was it was taking forever to move forward in the line. My blood was starting to boil. After about twenty-five minutes, just three people ahead of me had been served so I asked one of the staff behind the counter if there was a supervisor that could come and help explain what the delay was. They seemed to all be working quite hard and I made it a point to say that. I explained that I was not frustrated with any of the staff but something has broken down here. It shouldn’t take more than a few seconds – much less 5-10 minutes – to serve someone. Each time I asked to see who was in charge, the timid staff member pointed to another person. This went on for about five people and my frustrations were becoming more audible. Eventually, a manager (I presume) arrived from behind me. I explained – loudly, it does have to be said – that I was frustrated because I had no idea what food I was able to order, no idea how much it was going to cost me and sick of the fact that I had stood in this same spot for now almost half an hour. To his credit, the young man dealt with the situation (me – the irate complaining customer) very well. He conceded all my points about the system not working especially well. Agreeing with me instead of debating the issue was, in retrospect, a good way for him to diffuse the situation. The TV screen was evidently off because it had overheated. None of the printed menus in any of the restaurants anywhere in the park have prices printed on them. That’s just how they do it. He didn’t say as much but I assume it’s because the prices change occasionally and it’s just more convenient to not have to re-print the menus all the time. After about a minute or two of me offloading on this poor chap, I was feeling a lot calmer. He then expressed his sincerest apologies for the inconvenience and invited both Sandy and me to go take a seat. He was going to see that we got everything we needed, and it would be on his dime. This was, of course, a very nice gesture and a welcome one to be sure, but I didn’t explode (that’s probably a very good description by the way) for the purpose of scoring a free lunch. I even told him I now felt really bad about the whole thing. I also reiterated that I had no issue with any of the hard-working staff behind the counter. I even insisted that he make sure that message got back to them. He did insist, however, that he take care of us and we ended up not paying anything for the lunch today. A further nice gesture was to come at the end of our meal. The young lady that was directing the lines that took some of the initial brunt of my outburst came to our table with a bottle of water. She also apologised for the problems we encountered and wanted to make sure we were all happy. That was nice. By the time we were through with lunch, everyone was on an even keel again. None of the kids had seen my outburst and so were oblivious to it all. Sandy did feel my frustrations, I think. That said, I’m sure she felt much more comfortable once I had calmed down. Next door to the Simpsons area where we had lunch is the MIB (Men In Black) ride. It was so much fun that we did it a couple of times, although not everyone was happy the second time through. Each park attraction has a series of snaking walkways that take you through to the point that you enter the ride vehicle. This often winds through multiple staging areas where everything around you is themed to the ride. It’s a way of keeping everyone visually entertained while waiting to ride. With the parks largely empty, we’re just flying through these staging areas without stopping. In his haste to make it in to the ride, Joey slammed himself into one of the ends of the side railings, causing himself considerable pain in the process. This took a fair bit of careful management on our part, as he was really quite distressed. He did go onto the ride the second time, but he was clutching his stomach still and the ride attendant insisted the lap-bar needed to come down all the way to his stomach. This was a real pickle as we were by now all inside the ride car and holding up the entire process. In the end, after a bit of persuasion of Joey and the attendant, we reached a compromise. The ride continued but Joey wasn’t a happy bunny throughout. 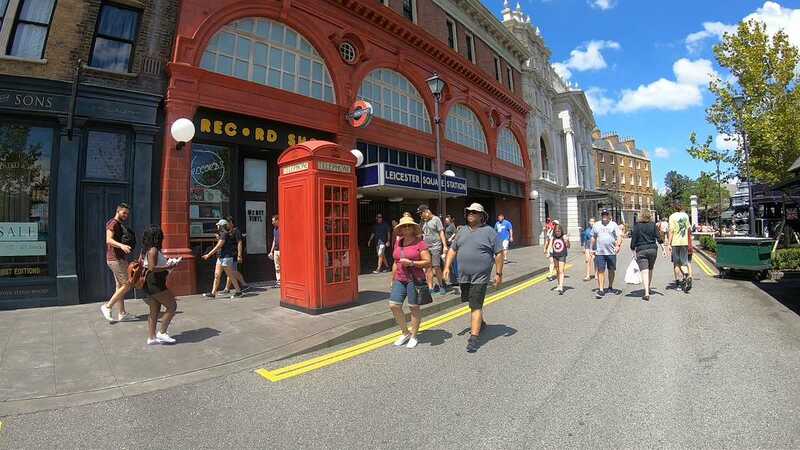 Back out into the hot Florida sunshine, we bought a couple of snacks and made our way back over to Diagon Alley, stopping along the way to take a peek at the Knight bus. 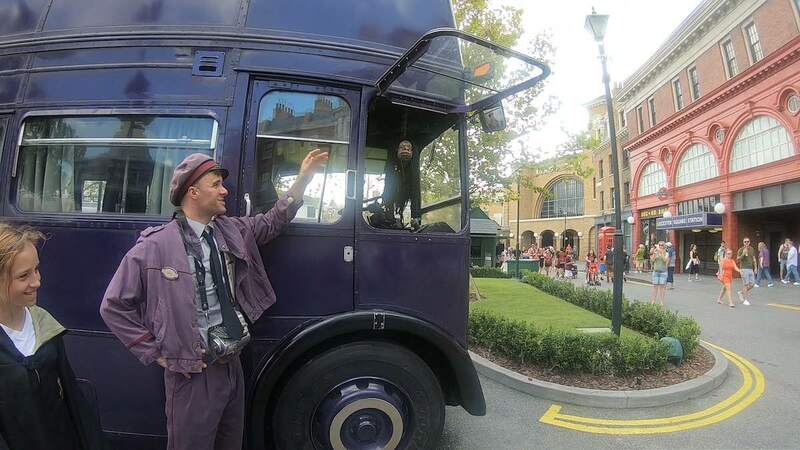 A character dressed as Stan Shunpike (the young bus conductor) was there by the driver’s side door along with a talking hanging head (you have to know the movies to understand). 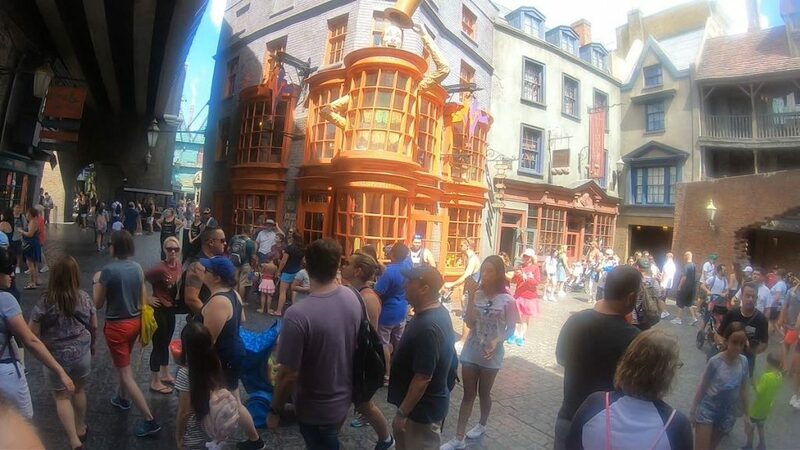 Inside Diagon Alley, Sandy gave Joey to me and she took Jennifer to go off and explore. The two of us went into the Escape from Gringott’s ride, which Joey absolutely loved. Once again, we did have to stow all our bags and things, but we went up the express lane and straight in. In the event, there was barely any advantage to using the express lane. The ride wasn’t busy at all. 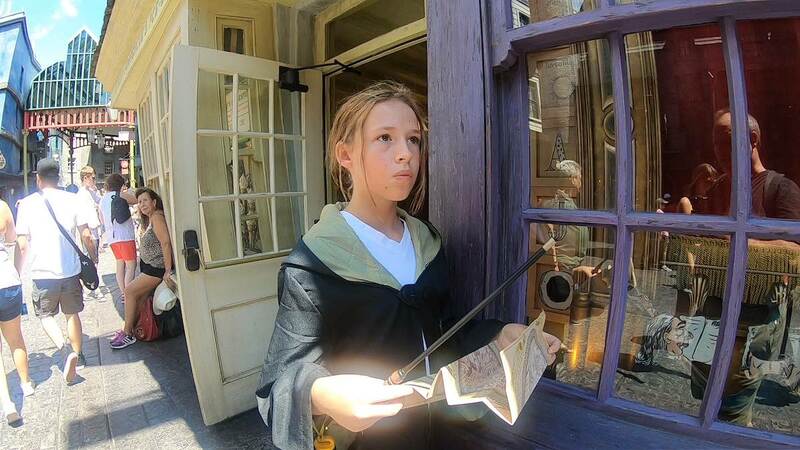 Throughout the remainder of the evening, Joey explored Diagon Alley, trying out his wand in the various nooks and crannies. It wasn’t long before the weather turned. The rain wasn’t ridiculously heavy as it has been before, but it was enough to send Joey and me scurrying for shelter. I called Sandy, so we could meet up again, but she was already inside the Gringott’s bank with Jennifer. We agreed I’d take Joey in and we’d do a child swap. This is where you can store your child and previous rider while the second adult does the ride. By the time we exited the ride, we were all a bit damp, tired and feeling rather lethargic. It was time to go. Back home, Sandy cooked us all a meal, which was actually a nice change from eating out. After the food went down, the whole night-time routine kicked in. The kids were settled in to bed and I tended to the digital duties.